Lytro's amazing "light field" camera tech has everyone from pro photogs to casual clickers abuzz. But the innovations now en route suggest that the company's best is yet to come. That video above explains the new photography that Lytro is bringing the world. Click anywhere in the photos it produces and you'll instantly refocus the image at that point. And you can zoom in, too. The beauty part? It's no million-dollar, Matrix-like special effect--just an image snapped in a single second, like any other digital photo. The technology behind it--plenoptics or light field imaging--got the tech press all excited about the "focus-free" powers of the coming Lytro camera. Then, when Lytro revealed the product, buzz picked up anew. The thing is, the real excitement about this technology is yet to come. And when it does, that's when everything about imaging may truly change. Most of us grabbed onto the tech's easiest aspect when they first heard about Lytro--the fact that unlike current camera technology, making a photograph doesn't require you to focus on something at the moment of snapping. This has meaningful implications, from new ways to consume photos to a faster time between turning a camera on and snapping a photo. But this misses a huge amount of technology and science in the invention. Some of the remarkable science is revealed in the first Lytro cameras, yet to go on sale, but which were shown last month. The unusual minimalist form of the units, unlike any other camera you've ever seen, highlights that this is a new photography type. The format of the zoom lenses and the plenoptic array that's the secret to capturing all the light "rays" from a scene rather than light falling on pixels (as in a typical digital camera) more or less shaped the design. And the final third of the unit, which contains the complex electronics that processes the data (which in development required hundreds of cameras hooked up to a supercomputer) ends with a touchscreen that instantly lets you try out the effect. Speaking with Fast Company Lytro CEO Ren Ng noted this was a bold decision, party shaped by a desire to be "open to whatever the [design] form might take, as long as it serves the end photographic goal...and to focus more on the end goal of the photographer." Because Lytro is speaking a new language of photography, it let the company make this design move in a way that perhaps other firms can't because they're locked into a design choice and an extensive userbase that is already familiar and comfortable with historic designs. Now everything is poised to change. It starts with that unusual camera, with its design and unique products--what's been dubbed the "living picture." You can pre-order them now, and though cagey about actual figures, Ng noted that sales interest has "been just enormous and terrific and in the aggregate wisdom of our team, from a forecasting perspective, has been pretty close to what we were expecting." Ng says interest has spanned the range from professional photographers to casual clickers to uncommon consumers like forensic photographers and those interested in "scientific imaging." This means thousands of light field cameras will hit the scene quickly, and then very soon you'll start seeing the images crop up in websites and apps and online newspapers. The phenomenon will likely go viral because of its unique powers and futuristic feel. Right away that's going to change photography, in the same transformative way digital photography has all but killed film photography. Other manufacturers will follow in Lytro's footsteps because, as Ng notes, "across very large parts of the industry, folks in positions of expertise and leadership realize that light fields are the future of imaging." Then it's just a question of "large companies with a large, stable market" to resolve the "classic innovator's dilemma" and dramatically pivot--which will take a longer time, but is probably inevitable. Lytro set out to deliver the whole package from camera to software to the entire ecosystem of experiencing the photos is that Ng's team "believes the technology requires a transformational product not an incremental product to bring the benefits to the end consumer." That is, Lytro is trying to be the iPod of camera tech. We know the megapixel war in conventional digital photography has changed digital cameras yearly, and has moved onto a new front: smartphones. As these cameras get better, and get carried everywhere "they really call into question the relevance of point and shoot cameras," Ng agrees, and "the dedicated camera market is backed into a corner" by the advances in smartphone imaging--even if the state of the art of these new tiny systems is compromised, optically, by their small size. Needless to say, just as Lytro is bringing fresh innovation to the handheld game and has an expansive future, smartphone implementations are "definitely on the roadmap" because as Lytro's research has shown "people are sharing pictures to social networks from mobile phones" as much as they're "passionate about picture taking" with normal units. Think about the benefits of a Lytro camera in a smartphone (no need for focus, almost instant-on and instant-snap, better low-light performance) and imagine millions of users snapping light field photos and sharing them on Twitter and Facebook, and you can see how transformative it'll be. But the technologies are equally applicable in "smartphones and high-end cameras." All of this is still talking about still imagery, and with just a few "special effects." But as Ng points out, "it turns out that in every shot these pictures inherently capture 3-D data" and there are other developments like "parallax" (which means you can move your viewpoint across the photo a little so, in effect, you may see behind obstructions in the foreground) and "new editing facilities that are unique to light field images" that are coming in Lytro's software roadmap and will surpass the powers you have in systems like Photoshop. And, thanks to the physics of the invention, all of these future processing options will "apply to every picture taken with Lytro cameras from day one." Finally, let's talk video. Exactly the same imaging benefits also apply to videos with these cameras. Ng agrees. "There's a lot of hard engineering to get video to work, because you have to capture a light field image at every frame--a lot a data. To take advantage of it involves a lot of processing and smarts." But the "implications for video are terrific," Ng added, "for regular folks trying to shoot video or even for reality TV folks, for that matter, [where] focussing is basically impossible because you don't know who's going to do something interesting next because you don't have a script." Lytro video would instantly solve that problem, and as well as enabling a whole panoply of artistic and special effects that could make bullet-time look like an amateurish effort, the ability to shoot a movie digitally without worrying about focus could save huge amounts of time and money too. So this is a new technology that has a grounding in a very well established one but takes it into a wholly new direction. It has a direct development roadmap, as well as the plans to expand into special-purpose products alongside the main product. It may not happen in a snap, but it looks like Lytro will eventually change photos forever. COMMENTARY: Lytro is a Silicon Valley startup that's building on research carried out by CEO Ren Ng at Stanford, and its promise is simple: With its light field camera hardware and software, it could change photography in an almost unimaginable number of ways--starting with the thing that most news sites have picked up on this morning, the lack of a need to focus a photo. Meanwhile, Lytro's $50 million in startup capital has come from big names like Andreessen Horowitz and Greylock, and its technological team includes a cofounder of Silicon Graphics and the man who was the chief architect for Palm's revolutionary webOS software. So what's the fuss all about? It's called light field, or plenoptic, photography, and the core thinking behind Lytro is contained neatly in one paper from the original Stanford research--though the basic principle is simple. Normal cameras work in roughly the same way your eye does, with a lens at the front that gathers rays of light from the view in front of it, and focuses them through an aperture onto a sensor (the silicon in your DSLR or the retina in your eye). To focus your eye or a traditional camera you adjust the lens in different ways to capture light rays from different parts of the scene and throw it onto the sensor. Easy. This does have a number of side effects, including the need to focus on one thing. This adds complexity, and, if used well, beauty to a photo. The Lytro light field camera is a beauty and disrupts regular digital photography as we know it. I'm not quite ready to call the new Lytro camera revolutionary or disruptive. It's not the most beautiful looking camera, but it is a fun, user-friendly camera that is going to be popular with amateur photographers because it eliminates focusing the camera. Just point-and-shoot. Simple. You upload the pics to your PC and do the focusing later. Why didn't anybody else think of that? Commercial photographers need all of this and then some. The website does not explain what the companies future plans are for meeting the serious photographic needs of the professional photographer: time lapse, freeze frame, video, flash, B&W and distance photography. ABOARD THE BOEING 787 DREAMLINER – Boeing's much-ballyhooed but long-delayed 787 Dreamliner finally entered commercial service this week, flying paying passengers for the first time on an All Nippon Airways flight from Tokyo to Hong Kong on Wednesday. The ultramodern 787 is being hailed in the aviation industry for its technological innovations, including the carbon fiber construction that makes it the first jetliner not made of traditional aluminum and steel.But while the 787 is drawing acclaim from industry observers, how will it go over with ordinary passengers? The Dreamliner — which Boeing designed with passenger comfort as a priority — drew nearly unanimous positive reviews from the roughly 240 passengers lucky enough to secure a seat on its inaugural flight. Those passengers, however, might not be a good barometer for how the jet is received by the average traveler. Nearly all of them were on board because they enthusiastically sought it out. Only 100 seats on the 264-seat jet were made available to the general public, and ANA received more than 25,000 applications for those. The other 140 on board were a mix of journalists, airline officials and other industry workers. Also among those 140: six business-class fliers who bid for their seats on Flight 7871 via auction. One passenger — Gino Bertuccio of Miami — paid more than $33,000 via that auction to get his spot on the inaugural flight. He also flew on the inaugural flight of the Airbus A380 in 2007. So will the glowing reviews of the 787 hold up as the Dreamliner's passenger counts soar and as more airlines begin to fly the jet — possibly in less customer-friendly configurations than Boeing had envisioned? Henry Harteveldt, co-founder of San Francisco-based travel research firm Atmosphere Research Group says. "I think the 787's benefits will be appreciated mostly by frequent travelers and aviation enthusiasts. Passengers may have a better flight but may not know why, since some of these benefits are somewhat subtle." Bigger windows. In what was hands-down the top new feature cited by passengers on the inaugural flight, the Boeing 787's windows are now the biggest of any commercial passenger airliner. Boeing says the 787's windows are 30% bigger than those on aBoeing 767. The windows also are now positioned closer to eye level for most passengers, meaning fewer strained necks from looking out the window. Flight 787 passenger Stephanie Wood of Davie, Fla., when asked about her favorite feature on the 787 said. "The windows. You really notice it and it makes the plane feel so bright and like you're not shut in." Stephanie Wood who also joined the flight via the charity auction after she and her husband, Dean, successfully bid on a pair of business-class tickets. The couple would not divulge the price they paid. Storage bins. Boeing says they were designed to accommodate the wheeled roller bags that have become ubiquitous. The bins on ANA's 787 — which are about 30% bigger than on Boeing 777 aircraft — easily accommodated even large roller bags, though irregularly sized luggage could mean a less-than-optimal fit. In addition to making it easier for customers to fit their bags into the bins, Boeing thinks that will help more flights take off on time, because — in theory — passengers won't need as long to hoist their bags into the overhead bins. Cabin environment. Thanks to new technology on the Dreamliner, flights are pressured to the equivalent of 6,000 feet in elevation, lower than the 8,000-foot mark that's typical for commercial passenger aircraft. Boeing says that — coupled with the higher humidity levels possible on the 787 — should alleviate headaches, fatigue and reduce the general wear and tear travelers often feel from flying. Protected lap space. Patrick Smith, an airline pilot and Salon.com columnist, wasn't on the inaugural flight but was intrigued by ANA's economy class seats. She says. 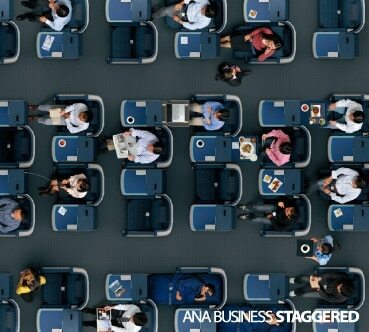 "ANA's shell-style economy-class seats. They have double-wide armrests and recline by sliding forward, not by hinging backward, meaning you never impinge on the legroom of the person behind you, even in the full recline position." 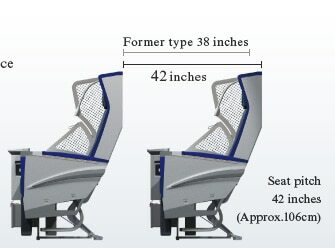 ANA has selected fixed back shell seats increased the seat pitch to 34-inches from 31-incheswith a sliding headrest and footrest for its new economy cabin. Each seat will have a 10.6-inch LCD touch screen, universal power port, iPod connector, USB port and a special cup holder. 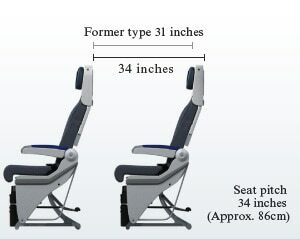 For premium economy, ANA has increased the seat pitch from 38-inches to 42-inches. Each seat back will have a 12-inch LCD touch screen with universal power port, iPod connector and USB port. ANA's new business class will feature fully a lay-flat seat in a staggered arrangement with a large side table, shoe storage and small in-seat baggage area. Each seat back will have a 17-inch LCD touch screen with universal power port, iPod connector and USB port. 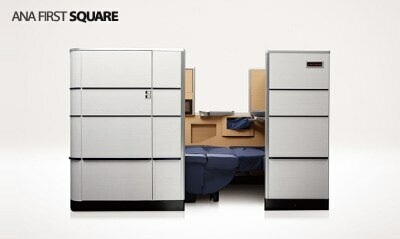 Re-branded as the ANA First Square, the new first class suite features fully lie-flat beds and a baggage compartment and mini-closet to hang your coat. Each Square will have a 23-inch LCD touch screen with universal power port, iPod connector and USB port. Cabin aesthetics. Vaulted ceilings between luggage bins and over galley areas help play off the larger windows to make the cabin feel more spacious. Despite that, the aisles on the 787's inaugural flight still felt clogged when passengers got up in bunches. Gadget friendliness. ANA's configuration offered USB ports and electric outlets at every seat, allowing customers to charge a cellphone or access music or movie files via the in-flight entertainment console. Power outlets mean laptops now can stay charged for an entire flight. Quieter cabin. Boeing has said cabin noise on the Dreamliner will be lower than on other jets that typically fly on long-haul routes. While that was hard to quantify on the inaugural 787 flight to Hong Kong, most passenger conversations seemed to flow easily. Another advantage for airlines (and environmentally concerned passengers): The Dreamliner's reduced weight and aerodynamic profile will increase fuel efficiency up to 20%. Still, Smith of Salon.com warns that even with all of those perks, not all Dreamliners will be created equal. "In the end, though, how the plane is received will mostly come down to the way its operators tailor and customize the experience." Chris Sloan, another inaugural flight passenger, suggests the Dreamliner has been subject to overhyped expectations lingering from the 2007 debut of the Airbus A380 — now the world's biggest passenger jet. During that rollout, the A380's selling point was obvious: size. Sloan says the 787's significance is just as important, albeit more subtle. Sloan says of the 787's possibly inflated expectations. "Superficially, the windows are great. The high ceilings are great. And the bins. Do people really think all of a sudden economy class is going to become first class? No, it's not." Sloan and others say the 787's strengths will get a chance to shine once the carrier begins flying the ultra-long-haul flights it was designed for — flights of more than 10 hours that will be significantly longer than the Dreamliner's four-hour debut flight between Tokyo and Hong Kong. "We'll really see those advantages on a 14-hour flight. 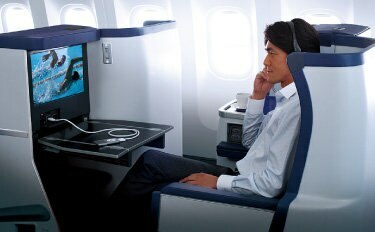 A lot of these features will be much more apparent on ultra-long-haul flights. When you're exposed to those sort of conditions for 13 or 14 hours, that's when the Dreamliner will be at its best." The first such service for the Dreamliner will start in January, when ANA will deploy the aircraft on a route between Tokyo and Frankfurt. Starting next year, United hopes to put its first Dreamliner on a long route of its own: Houston to Auckland, New Zealand. Until then, however, that leaves the question of whether ordinary travelers will be savvy enough to notice the 787's differences — such as the double armrests that will keep middle-seat customers from fighting over a single armrest. Stephanie Wood says she isn't sure. "Will people notice those things? I don't know. "They're nice features, but — for some — they may not." The Boeing 787 Dreamliner, which is revolutionizing how jetliners are being built, takes to the skies October 26 for the first time with passengers on board. The jet was from Tokyo to Hong Kong by All Nippon Airways. COMMENTARY: The Dreamliner may well deliver on the flight improvements. But as more than 800 orders for the $185+ million plane piled up from airlines, the ambitious high-tech advances and far-flung manufacturing process caused world-class headaches. The delays gave Airbus time to develop its A350, a carbon-composite plane the Europeans claim will carry more passengers, fly farther and burn less fuel than the Dreamliner. Analyst Michael Boyd, president of the Boyd Group in Evergreen, Colo says. "The A350 is going to be a whale of a competitor. If Boeing could have brought out the 787 three years ago like they were supposed to, it really could have hurt Airbus." Even Boeing managers, whose predecessors were cavalier about the Dreamliner's challenges, say the company will reevaluate offshoring strategies for future planes. Yet Boeing's bacon may be saved by massive overall demand for jetliners. Boeing expects a $4 trillion world market for new aircraft over the next 20 years. Airlines must replace aging fleets. China and other emerging nations are expanding aviation. And most importantly, carriers need fuel-efficient planes. So Boeing is boosting commercial aircraft production by 40 percent over the next three years. NOTE: Boeing fucked up, pissed off a lot of customers, and many of those 800 orders could endup being cancelled due to the three year long delay. Boeing executives are in China, Australia, Southeast Asia, Latin and South America, furiously negotiating with a dozen airlines to prevent massive cancellations of orders. If those orders are cancelled, we could be seeing the end of Boeing as we know them, and lose another major manufacturer to Airbus. The Boeing 787-8/9 Dreamliner is a super-efficient airplane with new passenger-pleasing features. It will bring the economics of large jet transports to the middle of the market, using 20 percent less fuel than any other airplane of its size. Less than 10,000 holes due to composites. I thought it would be interesting to review the events leading up to and after England's King George VI's famous radio broadcast "Speech" declaring war on Germany on September 3, 1939 and the movie trailer of the movie "The King's Speech". COMMENTARY: I think "The King's Speech" will win it all. Enjoy and learn something. Hanna Emelie Ernsting creates a mighty morphin' sofa for the many shades of the human condition. Furniture designers love to talk about the ways their seating “encourages interaction” and “engenders conversation” and “fosters intimacy.” Which is great, if you like people. For the rest of us, there’s Moody, a clever little couch that morphs to fit our inner Howard Hughes. Or you could roll the fabric out on the floor like a bed if you’re feeling lazy or throw it all over the place if you’re in the grip of a red-hot temper tantrum. The beauty of the couch is that it can be manipulated to suit every last whim. Think of it as the living-room equivalent of an emoticon. Ernsting showed the couch as part of a bigger collection -- which includes a Moody chair and a Moody “nest” -- at the design fair IMM Cologne recently. More info on her website here. COMMENTARY: The Mood Coach. What a splendid idea. I like the Moody Nest coach and Moody Bag the most. 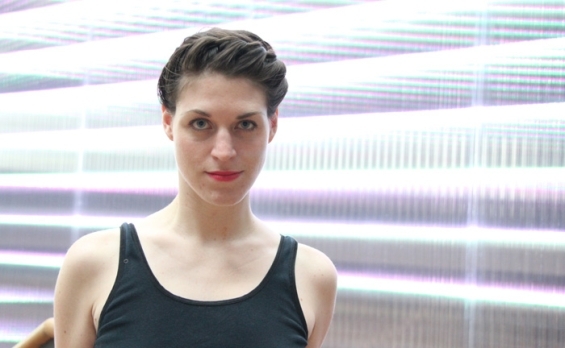 There is something definitely feminine, unorthodox, sensual and naughty about Hanna's designs. I can definitely visualize Marilyn Monroe, Lady Gaga and Madonna laying provocatively in her Mood Coach. I am not into the red color fabric, preferring more earthy color tones. The Mood Coach combinations are endless. I would like to see Hanna include patterns too. I think Hanna definitely has found her niche. Danke! The latest from the Danish powerhouse is billed as a model of what founder Bjarke Ingels calls "hedonistic sustainability." The absurdity of the notion -- of converting an epicenter of waste into a happy funzone -- takes on epic proportions when you consider this: Copenhagen is dead flat. The only skiing to be done there is cross country. So Ingels is simultaneously introducing an entirely new form of entertainment (sure to draw at least a few curious tourists away from Tivoli) and giving Danes what they’ve perhaps always secretly wished for: a taste of the highlands across the North Sea. BIG won the 3.5 billion Danish crown (about $644 million) project in a design competition against foreign heavyweights like Wilkinson Eyre Architects and Dominique Perrault Architecture, and Denmark’s own rising star 3XN. And yet, it’s unclear exactly how green the whole thing will be. Artificial ski slopes are notoriously energy intensive. That said, this one has the benefit of being completely outdoors, which slashes cooling loads, plus the slope itself will be made from a recycled synthetic that’s kinder to the environment than your average fake ski run. The building’s exterior is billed as a “vertical green façade” with planters stacked like bricks (see below). The surrounding land will be turned into a recreational park. As for the energy plant: The press writeup describes a modified smokestack that’ll emit smoke rings every time 1 ton of fossil CO2 is released “serving as a gentle reminder of the impact of consumption.” Aside from that, the writeup is short on specifics that support the idea of the plant as a model of hedonistic sustainability, though if Ingels says it’ll be green, we’re inclined to believe him. The guy’s awfully good at getting his way. The Waste-to-Energy Plant is slated for completion in 2016. For more Co.Design coverage of BIG, go here. COMMENTARY: Bjark Ingels is one incredible architect. You have to hand it to the Danish. Holland is to church architecture what Florida is to subprime real estate. The Dutch God industry has been gutted, and the country now faces a vexing problem of demand: too many houses of worship, too few people willing to fill them. One smart solution could be to do what Zecc Architects and Thomas Haukes have done: turn the vacant buildings into chichi townhouses (deluxe real estate being a sort of religion of its own among the moneyed set). In Utrecht, the designers revamped a vaulting 19th-century brick church to resemble a hip Tribeca loft. Gone are the pulpits and the altars and the endless pews and the little old Dutch ladies worrying their Rosaries. In their stead, you’ve got bleached white walls and aggressively cool contemporary art -- all arranged under a 46-foot-tall nave, the original 1911 stained glass windows throwing light just yonder. Architects like to say that the greenest buildings are the ones that are already built. That certainly seems to be the case here. Zecc preserved the structure’s shell (and, thus, its embodied energy), but drastically altered the interior by adding what they call “a sculpture” -- basically, a building within a building. There, they stowed the bedrooms, a study room, and a bathroom, ensuring that much of the structure’s heating and cooling are confined to a small space. It also gives the building some much-needed human scale. Neat as old churches are, you don’t really want to be reminded that God is watching you while you’re on the can. All of which goes a long way toward saying that St. Jakobus Church is an excellent case study in how to adapt abandoned churches -- which litter Holland, yes, but much of Europe, too -- for the secular age. Now, for the exciting news: The church is for sale! Zecc Architecten built it on spec for the client Woonkerk XL, meaning that if you happen to live in Holland and you happen to have more money than God (we assume, we actually have no idea how much this thing costs), it can be yours for the taking. We’d happily buy it. Alms for the poor? COMMENTARY: Very lovely. These guys at Zecc Architects do great work. Checkout their website. I think you will also agree.